Pumpkin is the quintessential fall flavor. Many people wait, anxiously, for that tinge of coolness in the air to make something with pumpkin. 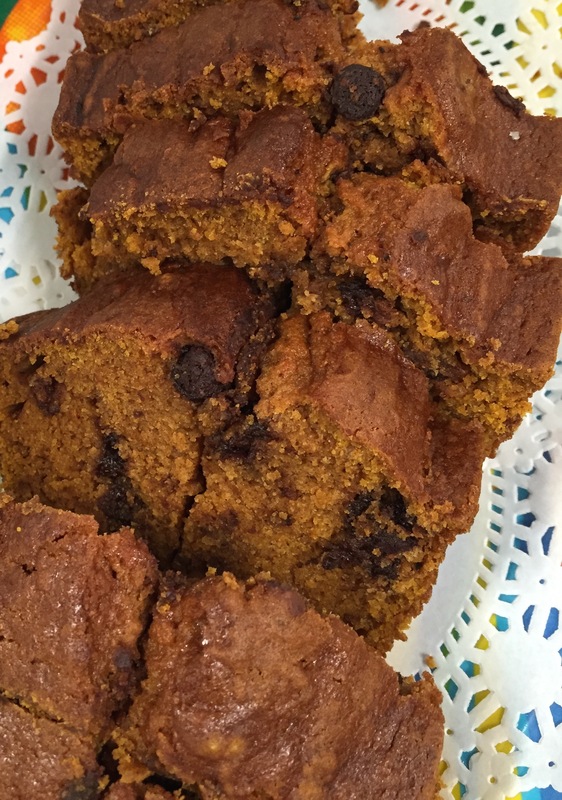 My Mom loved this pumpkin bread recipe. It gave me great pleasure to know how much she enjoyed it. Whenever I would visit her in the fall she would ask me if I brought her pumpkin bread. I started bringing it to her regularly. It always put a smile on her face. Originally, the recipe made 6 mini loaves but I converted it to make 2 regular size loaves. The mini loaves are perfect for gift giving or to give your guests at a dinner party to take home. I prefer using milk chocolate chips but semi-sweet or bittersweet would be good too. I do not use an electric mixer for this recipe. With the amount of sugar and flour, I find it easier to mix by hand with a wooden spoon. Less messy too. Spray 6 mini loaf pans or 2 9×5-inch loaf pans with cooking spray. In a large bowl mix together flour, sugar, baking soda, salt, cinnamon, nutmeg and cloves. Pour melted butter, pumpkin, beaten eggs and water on top of dry ingredients. Mix until combined. Add chocolate chips and stir gently. Pour the mixture into prepared 6 mini loaf pans or 2 9×5-inch loaf pans until each is 2/3 full. Bake at 350 degrees for 45 to 50 minutes for mini loaf pans or 65 to 70 minutes for larger pans. Makes 6 mini loaves or 2 larger loaves. Larger loaves make 8 servings each. This entry was posted in Bread, Breakfast, Entertaining, Favors, Makes A Great Gift and tagged bread, Chocolate chips, fall flavors, milk chocolate chips, pumpkin, pumpkin bread, sunday supper movement. Bookmark the permalink. A family favorite around here—and I’m going to have to try your version with milk chocolate chips! YUM! This sounds delicious! My kids would love it! Chocolate chips for breakfast, why not! Your little loaves would make fabulous gifts at Thanksgiving or Christmas time as well, Ellen! What a great recipe. Welcome to Sunday Supper as well! Thank you, Stacy! You’re idea is a great one. You say fall, I say pumpkin and adding chocolate, well, I was already there!! Looks delicious! What a fabulous recipe for gift giving! Plus I think my kids would like this too. Your bread looks delicious! I am so ready for fall. This bread sounds delicious! Love the combination of autumn spices with chocolate and pumpkin. This would make a wonderful “favor” for a Thanksgiving table. Sounds delicious. I like the addition of the chocolate chips! Great tip making mini-loafs for gift giving!! This would be a perfect after school treat! oh man! A friends mom in high school made this and I would always try to get extra slices!! This sounds really good! Chocolate chips in quick breads just make them 10 times better, in my opinion! I am pinning this one. I would love a slice of that right about now!